This post isn’t about adventures or crazy stories. And you won’t learn how to convert a van neither. This article is just me and my thoughts. Now, one and a half years after moving to Mexico I can say it was the best decision I’ve ever made! And it definitely paid off to take the risk. 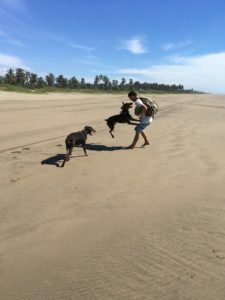 To be down here in México with my soulmate Peter and my beautiful dogs Mérida and Ikarus, is probably the best thing that ever happened to me!! It has opened up a whole new world for me! I met so many amazing and interesting people! And now I’m getting the chance to do what I love. Traveling around the globe and being creative! Finally for the first time in my life everything feels absolutely right!